Cabinet papers from 1975 detailing the government's plans in the event of nuclear war are among new documents released by the National Archives. They reveal that government bunkers would be manned by civil servants, emergency legislation would be passed, and hospitals would be emptied. The prime minister would be taken to his bunker but there were no plans at that time to evacuate civilians. The information is among a raft of unseen material that has been revealed in government records from 1975, now released to the public at the National Archives in Kew, south-west London. He said: "These were the Crown Jewels of genuine official secrecy...because you didn't want the other side to get your war plans. "Also the degree of alarm for the civilian population, in relatively tranquil times, that a leakage of this would have produced would have been extraordinary." 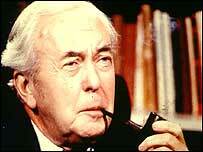 Other Cabinet papers showed Harold Wilson was warned in 1975 that Britain's economy faced "possible wholesale domestic liquidation". One minister told the Labour prime minister there could be constitutional crisis if inflation continued to rise. Documents show concerns a year before an International Monetary Fund loan was requested. They also reveal Chancellor Denis Healey and Industry Secretary Tony Benn at odds over policy. Two pandas in London Zoo sparked fears a diplomatic rift could flare up between Britain and China in the 1970s. The extent of behind-the-scenes Cabinet splits before the 1975 referendum on British membership of the Common Market. How British diplomats secretly floated the idea that Iraqi dictator Saddam Hussein - seen then as a figure to be courted - could be brought to the UK for a back operation. That in discussions between Prime Minister Harold Wilson and the BBC's chairman they talked about whether there were too many "hippies" in the corporation. The blocking of plans for the Queen Mother to fly to Iran in Concorde by Harold Wilson because he was worried about the plane's safety. The prime minister's plan to protect local breweries by nationalising them as part of an initiative to show he was sensitive to small problems that caused people concern, called "little things that mean a lot". That John Stonehouse, the Labour MP who faked his own death, spent months rehearsing his new identity.